Should I Adopt One Cat or Two? The disadvantages are that it does cost more for veterinary care, food, pet supplies, boarding over vacations and emergencies. Then there are the day-to-day clean up chores like changing two litter boxes, sweeping up extra cat hair and the occasional furballs or dead critters they have bestowed upon you as gifts. Additionally, cats often mimic each other, so if one scratches the furniture or marks its territory on your bed, the other may follow suit. If you decide to get two cats, know that cats that are familiar with each other will get along easier and be more adaptable to their new home with you together. 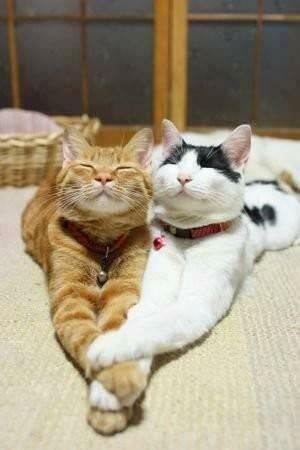 Often the shelter you adopt from can tell you two cats or kittens that appear to be compatible. They will provide you with suggestions for introducing them at the same time into your home. Kittens from the same litter have already been socialized together. They tend to know each others limits when it comes to play and tussles. They come from the same background. For example, if they were strays, they will have the special sense of survival bonding. If you already have an adult cat at home, look for a companion with similar habits and personality. There are many websites that can help you with step by step rules for introducing a new pet with an already established one. This will ease the transition and make life enjoyable for all of you. The best thing about adopting 2 kittens or cats is that you are saving two lives. On top of that you are enhancing your own with the fun and laughter that comes from watching them get crazy with each other!